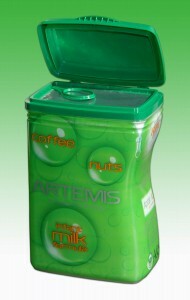 RPC Containers Corby has launched its latest innovation in modern pack alternatives to more traditional formats, in this instance tins and composite packs.The new Artemis jar provides a practical and convenient solution for a variety of dried, powdered and granulated products such as nuts, instant coffee and infant milk formula. The high barrier material structure protects products against moisture and oxygen (and has the option of a UV-light inhibitor), meaning there is no need for the product to be bagged inside the container. The design incorporates a new non-round neck feature, making use of Apta’s BAP® ‘Quantum’ closure. This type of neck-finish and closure combination gives an induction weld for confidence of product integrity, and therefore product and shelf life longevity. An integrated ring pull ensures easy opening for consumers and the flip-top lid provides the convenience of resealing between uses, helping to maintain product freshness and minimise food waste. In addition, the jar’s light weight, recyclability and long ambient shelf life offer important sustainability benefits.The jar is blow moulded in a multilayer PP/EVOH/PP structure, suitable for both hot and cold filling, and complies with current food contact legislation. Its standard design creates a distinctive appearance on shelf, while good contact clarity enables products to be visible. The design also provides a wide area for effective decoration by printing, labelling or sleeving, allowing brands to create a unique appearance, with plenty of room for eye-catching graphics as well as product information, instructions and marketing messages. Bespoke shapes can also be created to meet specific customer and brand objectives.